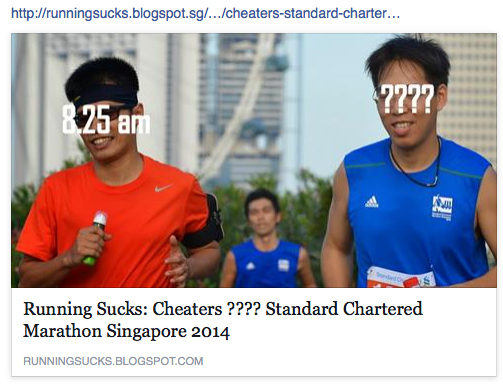 If you have circulated that article about “cheating runners” at the StanChart Marathon, the article was incorrect and injurious to honest runners. StanChart has clarified that the route was deliberately shortened for laggards. The page hosting the site has since been removed. The author is a photographer and runner, whom on the day of the event, set himself up at the 35km mark of a marathon to take pictures of the runners. Observing that some runners had taken “short cuts”, he speculated that these people must have been cheating. He wrote the article in his blog with such strong tone, even proclaiming that he was executing judgement in the form of “cyber bullying” against the alleged cheaters. He accused Standard Chartered of not enforcing rules during the run. In a way he did succeed, press reports said one of the runners falsely accused was in tears and swore off the race ever again. There is a reason why proper channels of complaint, process and investigation exist. Sometimes people jump too quickly to their own conclusions and perform all manner of antics on the readily available social media. Many times, to their shock and horror, their accusations turn out to be false. » So you wanna adopt a puppy?